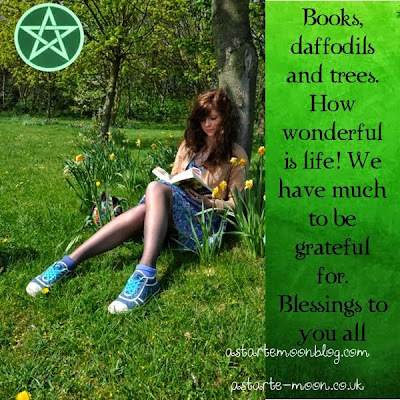 Astarte Moon Inspirations a life closer to nature's rhythms : Books, daffodils and tress. A quote on gratitude and the wonders of nature. Books, daffodils and tress. A quote on gratitude and the wonders of nature. Books, daffodils and trees. How wonderful is life! We have much to be grateful for. Try and take some time this month to spend a little time with nature. A walk around your local park, or sitting beneath an ancient tree are wonderful ways to ground yourself. Even spending five minutes each day just standing barefoot is a fabulous way to connect with the earth and ground yourself. Let nature's strength and love course through your veins, re-vitalising you and filling you with serenity and hope. For my cousins on the Southern Hemisphere, happy arrival of spring to you. I am very grateful for all that nature provides for us and very much looking forward to the arrival of spring with its beautiful bulbs and blossom on the trees. In the meantime I am going to offer gratitude for the autumn and winter and all their magickal delights. As the wheel turns there are always so many wonderful things to be grateful for. Our Mother Earth, Gaia is truly an amazing place, giving us her unconditional love.